Posted by M Bharath Bhushan in Congress, elections, JAC, KCR, politics, regionalism, Settler, Sonia, Telangana, TRS, violence, Warangal, Y S Jagan, YSR. HYDERABAD: Telangana Rashtra Samiti chief K Chandrasekhara Rao expects a political crisis of unprecedented dimensions after the byelections on June 12 for one Lok Sabha and 18 Assembly seats in the state, forcing the Congress to accede to the demand for bifurcation of the state. Posted by M Bharath Bhushan in agitation, Congress, elections, Identity, politics, regionalism, Sonia, Telangana, Telugu, TRS, Y S Jagan. 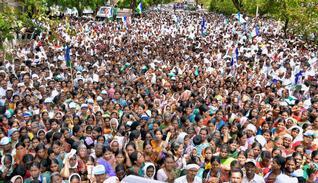 Efforts by local Congress leaders and the high command seemed to have not worked on party legislators from Telangana who remained steadfast in their resolve to resign from their posts en masse on July 4 in support of a separate state. Congress chief Sonia Gandhi’s political secretary Ahmed Patel is said to have called MPs Keshava Rao and Ponnam Prabhakar over phone and tried to prevail upon them to give up their tough stance as the statehood issue was under consideration. “Since the high command is busy holding consultations with various political parties for the preparation of the Lokpal Bill, please wait for some time,” Patel reportedly requested the MPs and asked them to reconsider their decision to resign. Even state chief minister N Kiran Kumar Reddy and Pradesh Congress Committee chief Botsa Satyanarayana held talks with ministers, MPs and MLAs from Telangana separately for several hours today and tried to placate them but to no avail.